24 December 2007: Using ESO's Very Large Telescope, an international team of astronomers has discovered a stunning rare case of a triple merger of galaxies. This system, which astronomers have dubbed 'The Bird' - although it also bears resemblance with a cosmic Tinker Bell - is composed of two massive spiral galaxies and a third irregular galaxy. 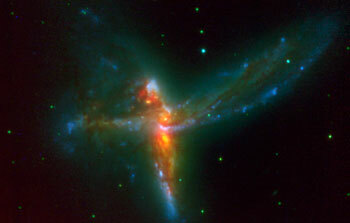 In this image, a 30-min VLT/NACO K-band exposure has been combined with archive HST/ACS B and I-band images to produce a three-colour image of the 'Bird' interacting galaxy system. The NACO image has allowed astronomers to not only see the two previously known galaxies, but to identify a third, clearly separate component, an irregular, yet fairly massive galaxy that seems to form stars at a frantic rate. 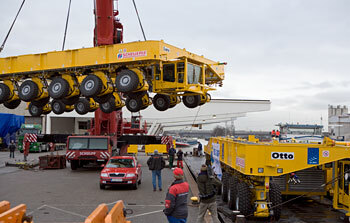 17 December 2007: On 3 and 4 December 2007, the two ALMA antenna transporters, Otto and Lore, were being loaded onto a barge on the Neckar at Heilbronn harbour (Germany) to start their long journey to Chile. From there, they will travel to Antwerpen (Belgium) and then put onto a ship towards the port of Mejillones, in the north of Chile, to finally reach the ALMA base, close to San Pedro de Atacama. 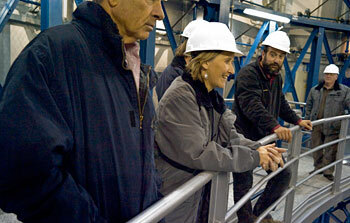 The ALMA antenna transporters are each 20 metre long, 10 metre wide and 6 metre high, and weigh 130 tonnes. They will be able to transport a 115-tonne antenna and set it down on a concrete pad within millimetres of a prescribed position. 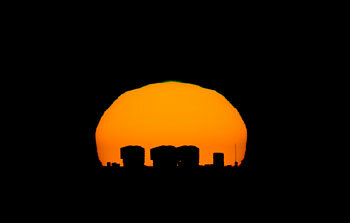 Image taken in December 2007. 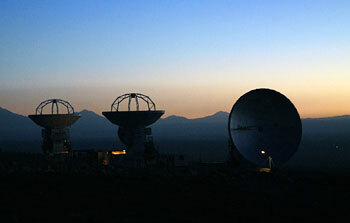 10 December 2007: The first three Japanese ALMA antennas of the Atacama Compact Array (ACA) at the ALMA Operation Support Facility, located close to the town of San Pedro de Atacama in the Chilean Atacama Desert, at an altitude of 2900m. At the time of the picture, in November 2007, the antennas were undergoing final tests before being handed over to the ALMA Observatory. The 12-m antennas were built by MELCO for the National Astronomical Observatory of Japan, one of the partners in the ALMA partnership.